When Wen-lu Zhu picks up a rock, she sees more than a static object. Each rock was shaped by powerful forces deep in the Earth’s crust and mantle. For her, these rocks offer a window through which she can examine how the Earth works. They provide insights into the eruption of volcanoes, the causes of earthquakes, or the formation of hydrothermal vents. But in order to open this window, she must bring the rock into the laboratory and examine its physical characteristics or mechanics. X-ray synchrotron image of an intact Darley Dale sandstone sample. The lighted area represents pore space. Many factors may play a role in shaping a rock while it is within the Earth’s crust or mantle. Extreme temperatures, pressure and, stress may reshape or deform it. Chemical reactions with surrounding fluids may alter its composition. All of these processes take place well beyond our reach. So instead of trying to unzip the crust and peering inside, Wen-lu and her colleagues recreate in the laboratory the environment that the rocks experienced. They raise the temperature, increase the pressure, or twist the rock then examine how each of these factors affects its structure. By testing how each one of these factors affects the rock, Wen-lu and her colleagues can determine the dominant forces that shape it. When Wen-lu arrived at the Woods Hole Oceanographic Institution, she turned her attention to the rocks found around hydrothermal vents. Wen-lu working in her laboratory. These vents form along the volcanically active mid-ocean ridge on the deep ocean floor. Seawater seeps down through cracks in the seafloor, is heated by magma far below, then rises back up and spews out of vents. As the seawater heats up, it reacts with the rocks in the ocean crust. These reactions alter the chemistry of the hydrothermal fluid which in turn affects the chemistry of the entire ocean. Wen-lu is attempting to find out how the structure of these rocks affects these chemical reactions with the hydrothermal fluid. One of the most important structural components of the rocks she is studying is their pore geometry. The rocks contain pores or holes in them which can be large enough to see or can be microscopic. If the pores are interconnected, the hydrothermal fluid can pass right through the rock. The greater the porosity (percentage of empty space in the rock), the more hydrothermal fluid can pass through and the more material the fluid picks up and deposits in the rocks. Stereo 3-D microstructure of a deformed Darley Dale sandstone sample. Lighter area represents pores. 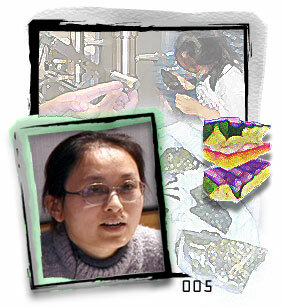 To determine the porosity, Wen-lu and her colleagues construct an image of the rock’s internal structure using a CT scan (x-ray computed tomography). This device is similar to the ones hospitals use to find tumors and bone fractures. Another important physical parameter that tells how fast a fluid can flow through a rock is the rock's permeability. They use a gas flow meter to measure the rocks permeability or speed in which material can flow through the rock. Currently they are examining the structure of the rocks at room temperature and at one atmosphere of pressure. In the future, they plan to heat the rock up to 350°C, which is the temperature the rocks experience in the hydrothermal vents. Read an interview with Wen-lu. Get more info on Wen-lu's background. See images of Wen-lu at work. See Wen-lu's typical work week. Other sites related to Wen-lu's career.